As you are probably aware, U.S. persons living overseas, who meet certain minimum income thresholds, have to file their U.S. tax returns and report worldwide income, as well as they are liable to pay taxes in their perspective country of residence. The U.S. tax laws allow a few instruments that prevent double taxation on the same foreign-earned income. One of it is the Foreign Tax Credit. 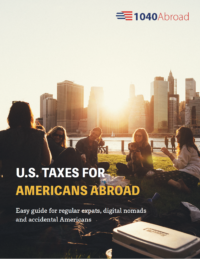 And in case if it’s news to you that you have to file your U.S. expat, don’t worry and read here how to become tax compliant with U.S. taxes. The IRS states if you paid or accrued foreign taxes to a foreign country or U.S. possession and are subject to U.S. tax on the same income, U.S. expat may be able to take either a credit or an itemized deduction for those taxes. In most cases and tax experts will agree that it is to U.S expat’s advantage to take foreign income taxes as a tax credit. Important to remember that you cannot use Foreign Earned Income Exclusion and Foreign Tax Credit at the same time. What are the advantages of claiming Foreign Tax Credit? We are often asked which one of Foreign Tax Credit or Foreign Earned Income Exclusion is better for U.S. expats to claim on their tax returns. We prepared this easy infographic, which explains the benefits of choosing Foreign Tax Credit. Even though there is no one answer fits all when it comes to individual tax situations but these are general advantages of claiming Foreign Tax Credit that you need be aware of as a U.S. expat. And do not hesitate to contact us if you have any questions related to your taxes. We will reply you within 24 hours and you will receive a professional advice at no cost. P.S. You can check out this infographic, where we compared both Foreign Earned Income Exclusion and Foreign Tax Credit.